I know I know... "what happened to the break?"... guess you got to me... or my kids... who offered to make dinner, so I got to sit and create something! ... so cross off "coworker leaving" card... did I have that listed??? Its spring time! I love the smell of my lilacs that are just outside my bedroom window, not that they are open yet. As it is, the weather is nothing near spring like... we have had hail and thunderstorms, plus some snow... ugh!!! So now you are asking - HOW DID SHE DO THAT? I used the Eggplant CS and drew a huge teardrop shape, using this as my base to glue on the Boho blossoms in Concord, Eggplant & Plum. I ran the colored cardstock on the edge of a table to 'break up the fibers' before I punched them out. Of course the method to the madness of adhering the blooms was trial and error. I used glue dots for my outside ones, and the green glue bottle for the others so I could move them into place. I did try to vary my shades according to the light - not that you can see that in the picture. The stem and leaves are from the 2 step bird punch. Beautiful and what a wonderful idea. Thanks for the inspiration as well as the instructions. What a gorgeous card & clever idea to boot! Lilacs are my favorite flower in all the world. My childhood house back home in the Adirondack Mts. had 21 lilac trees!!! They bordered the property & were of every color, both single & doubles!!! Lily of the Valley grew in the shade in under them, thus my 2nd favorite flower of all time! 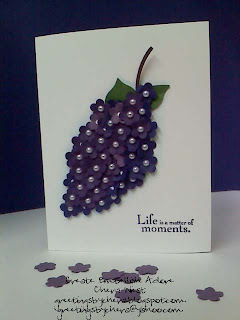 This is amazing Chera, beautiful card! Congrats for being Splitcoast Stampers card for today on Facebook!!! Your use of the different shades was amazing, the addition of the pearls makes it so elegant - truly you are a master. Unique and Beautiful card! Running the card stock on the edge of a table is a great tip. Thanks for sharing. That is adorable!! Love the purple!! This one is gorgeous Chera! You truly outdid yourself on this one! Spectacular! I LOVE this card! Now if only I could open MY bedroom window and smell the beautiful lilacs on the bush- well, at least when they get here, I will get to enjoy their wonderful fragrance. Thanks for sharing!